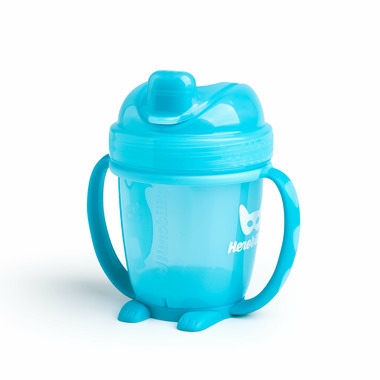 HeroSippy makes learning to drink from a cup easy and fun.Super cute HeroSippy is the perfect cup for a picnic adventure, or for your dinner table. The detachable, cute handles provide an ergonomic grip, ideal for little hands when your baby’s learning to drink all on their own. The adorable feet and tail make it extra steady. The soft spout is gentle on mouths, teeth and gums, and the lid is made to be easy to open and close for little hands. It’s also spill proof, and has a valve function, which only lets out liquids when your child is drinking. Our cute little arctic fox Felix is printed on the side of the bottle, playing peekaboo from behind the handles, which just might save the day. No mess, thanks to the drop free valve. Snap Lid, easy for little hands to open and close. Leak Proof. Soft detachable handles make the cup easy to hold. Little soft feet and a cute little tail make HeroSippy stand up extra steady. Gentle on little mouths, teeth and gums.